Several topics in this BLOG have provoked impassioned debate. We really appreciate that. Steven is a Software Engineer by training. Eric is a Molecular Biologist, and Harold is a jack of all trades. In addition to being an author and professional photographer, Harold’s background includes being an Attorney at Law and a Software Engineer. We do “geek” like nobody’s business! I, Steven am raising the geek card just to let you know that we do care about precision – but we care MORE about great photography and applying real-world principles to real-world problems. The biggest debate has been about what factors lead to streaking (trailing) in Night Photography shots of the stars. Shots of the night sky may produce noticeable streaks if the exposure length exceeds certain bounds with specific camera factors (focal length, sensor size and sensor geometry). But there are a huge set of assumptions behind the visibility of those streaks that are often overlooked. One assumption is that the finished image sizes are proportional to the size of the sensor used to create them – when does that happen in real life? Another assumption is that the viewing distance is proportionally related to the finished image size. These sound like they are reasonable, but in the real world, a print from a crop camera and a full-frame camera are extremely likely to be made in the same finished sized and viewed from whatever distance the viewer chooses! In the desire to get the math exactly right, many people trip over one or more of those assumptions. Our article about why the 600 Rule is a misguided way to determine the proper exposure length has had many proponents and opponents espousing the “inerrancy of the mathematics” and all the missing factors we may not have included. I love math, but: my assertion is that Reality beats theory when producing an image. And that’s why the conclusion of the article is that the proper exposure length is an aesthetic decision more than a mathematical one. The mathematics guide, but do not govern what the best choice(s) may be. I really enjoyed my Physics classes, especially mechanics. But I also remember all those exercises that included clauses like “neglecting friction”… In the real world friction with the the air and from tire contact on the ground is why a car on a flat road comes to a stop even though no brakes are applied. Air friction (drag) is why it takes eight times as much power for a plane to fly twice as fast. The reality of physic is why a lens, or sensor is always a tradeoff of something for something else. Perfect optics or a perfect sensor behavior is not possible at any cost. In the same way, a photographic exposure is always a tradeoff of one thing for another. If you need a faster exposure with a given amount of light you can: increase the exposure time, increase the sensitivity, or admit more light by opening the aperture. Of course you can also change more than one thing at a time. Indeed you MUST change more than one thing. Any change to one of the three factors requires a corresponding change to one or more of the other factors. What Exposure Settings Should I Use? If you ask me this question, I apologize in advance for rolling my eyes (it has been known to happen). I can give you a STARTING point, but remember that a starting point involves tradeoffs and conditions that can not be entirely foreseen. How warm is it? How much moisture, dust or particulates are in the air? How much turbulence in the atmosphere? How much artificial (or natural light)? What are the predominate colors of the light (white balance)? How efficient is your sensor? How sharp are your optics? How far away is your foreground from your background? What is that largest aperture available? How sharp is your lens at that aperture and at that zoom? What is important to you in the scene you’re trying to capture? And what are you trying to accomplish? My best advice: try an exposure and see what you get. When all there was was film, precision was a lot more important than it is now in the digital world where you can immediately see the result with a histogram and a myriad of other data to help you decide what to try next. In fact, here is your assignment. Go out when it is dark and shoot a photo of the moon. How dark is entirely up to you. Your photo MUST show the same kind of detail that you can see with your eye – the craters and the gradations from light to dark areas. Use a telephoto lens – notice I am not telling you how telephoto, that’s also your choice. 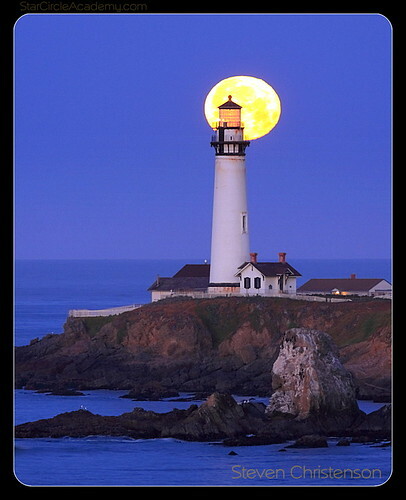 If the moon is “blown out” – and it probably will be, decrease the exposure. Keep taking photos until you get as much detail as you can. You will almost certainly need to use manual mode to set your exposures. What settings did you come up with? In our “Catching the Moon” webinars we provide starting settings and also advice about how those settings may need to be changed. **In retrospect, it was evil of me to suggest this. In only the most extraordinary circumstances is it possible with current technology to get a featured moon AND stars. The example above required 3 separate exposures. This entry was posted in Astrophotography, Contest, Creativity, Lens, Ravings, Sensor and tagged experimentation, pragmatism, reality, rules, streaking, theory, viewing distance on March 20, 2013 by Steven Christenson. In my last article, I discussed Bending Reality and where my personal ethical limits are in relation to photo manipulation. There has been some insightful commentary from very thoughtful people. In this article I reveal all the ways in which my “Solar Corona, Keck & Subaru” photo (below) can be discounted as a fake. Let’s start with the easy things. The EXIF date taken can be seen on Flickr as July 31, 2011. So there is an immediate red flag! Had I left the exposure information intact, there would have been more clues, but I wanted to hide the “iPhone” data! There were extremely few generally available digital cameras in 1991. Most were less than 1 Mega-pixel. A Hassleblad digital back or a professional TV broadcast camera were among the few that were larger than 1.6 Mpix – the size of the original photo on Flickr. The Subaru Telescope construction didn’t begin until 1992 and the enclosure wasn’t completed until 1994. The Keck Telescopes similarly didn’t exist in 1991. The first dome became operational in 1993, and the second in 1996. There is a very suspicious small “orange ring” around the perimeter of the sun. Suspicious because it indicates an annular eclipse, not a total one. The view is clearly taken from above since the horizon is visible about 1/2 a degree above the telescopes. The summit is less than 2,000 feet away after that it’s all down hill! The only way to move far enough away and still look down would be to do so from the air. The central (dark part) of the eclipse is alarmingly dark relative to the rest of the image. It’s darker, even, than the foreground which lies in shadow. At minimum this would indicate a composite or photo manipulation. The center is slightly off axis from the diffraction spikes above and below the sun. There are visible bright reflections off of the Keck domes – more characteristic of an un-eclipsed sun. If that is REALLY the solar corona it is much more extensive than very sophisticated instruments have observed – even more impressive than NASA photos. So there you go. Got anything else to add? Please let me know. PS Is THIS a photo of the Annular Solar Eclipse? 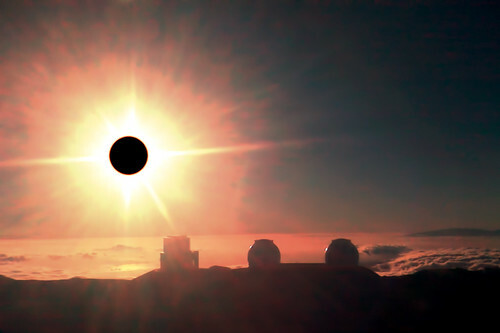 This entry was posted in Astronomical Event, Composites, Contest, Forgeries, Photo Tip, Ravings and tagged cheat, composite, eclipse, faked, hawaii, Keck, mauna kea, misrepresentation, observatories, revealing, solar, Subaru, Summit, Sun on June 5, 2012 by Steven Christenson. 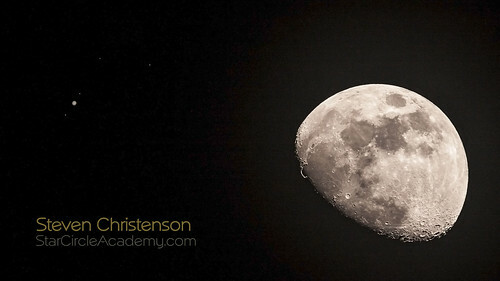 I’ve been teaching a “Catching the Moon” webinar approximately monthly. 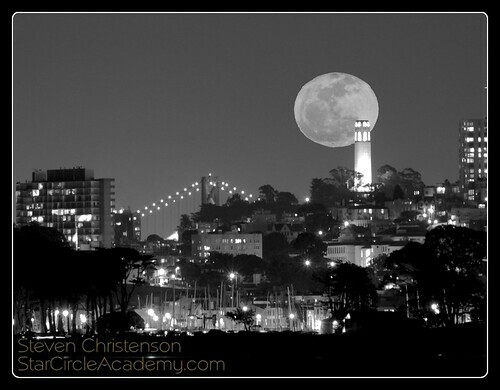 The focus of that course is to teach how to properly expose for the moon, how to catch the moon aligned with your favorite landmark, and how to determine the optimum light scenarios. The webinar is based on my Alignment 1 and Alignment 2 articles with a healthy dose of additional material including some private material for students only. One of the most difficult aspects of getting a moon alignment is that there is a pretty small optimum time window for getting an exposure. Shooting earlier or later makes the foreground illumination and the moon illumination all but impossible to get both exposed properly in a single shot. Here is an example of a single shot where the lighting was pretty close to perfect (though you can see the moon is a bit over exposed). However later that evening the sunset occurred quite a while before moon rise, so the sky and foreground were much darker. The photographer faces a conundrum. 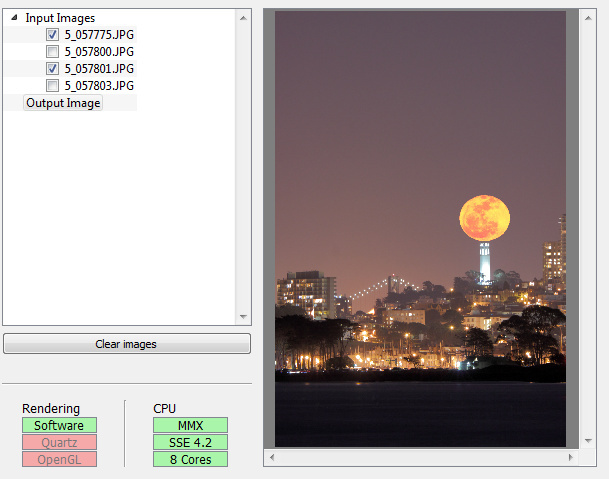 Expose for the foreground or expose to preserve moon features. 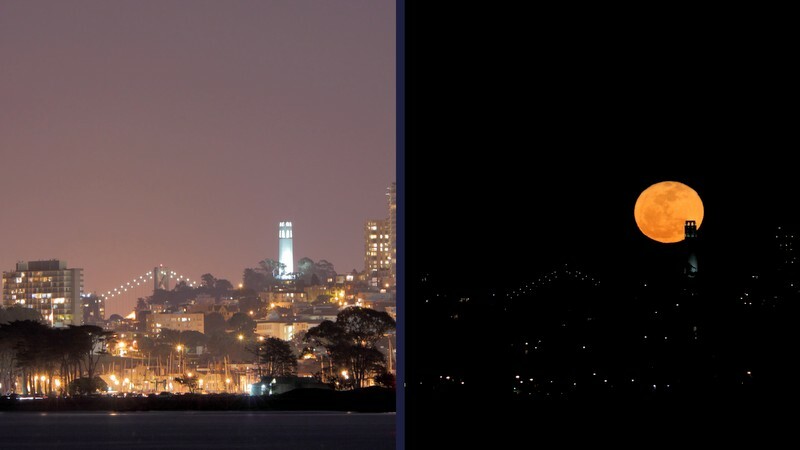 On the left is a 30 second exposure prior to moon rise (though a tiny bit of the moon is in fact visible). On the right a 1/25th of a second exposure. Both taken on a tripod at f/9, ISO 250, 444mm effective focal length. The problem is that a longer exposure renders the moon as a white featureless blob or streak (see below for an example). However exposing for the moon as on the right renders the foreground all but invisible. There are a couple of simple alternatives. One is to bring both images into Photoshop. 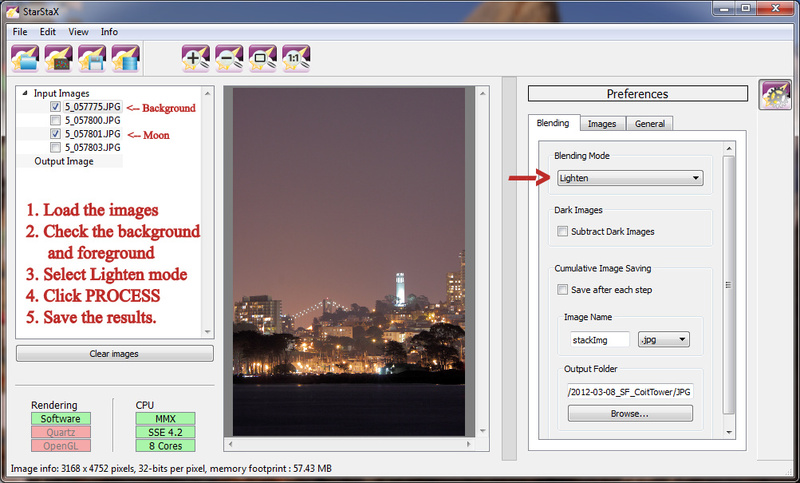 Make both images layers, the moon on top of the background and combine the two images using “Lighten” blending mode. That will work very well and it’s essentially what happens when using the StarCircleAcademy Stacking Action. But that action, and even Photoshop are overkill for this situation. Fortunately Markus Enzweiler offers a free solution called StarStax that runs on Windows, Linux and Mac that makes it trivially simple to combine these two exposures – assuming they were taken on a tripod and the zoom, focus and direction does not change between shots. StarStax is tailored to stacking star trails, but it does the same operation that Photoshop (and Image Stacker and StarTrails.de do). And fortunately you can make it do a little more with almost no extra effort… as in this example. When the first image was taken it was quite dark and required a long exposure to capture foreground details. Then all the moon images were taken with identical settings using an intervalometer. It’s interesting to note how the moon darkens and deepens in color as it sinks in the atmosphere. So how do you create the simple or “stacked” motion images? Easy. And here is the result. 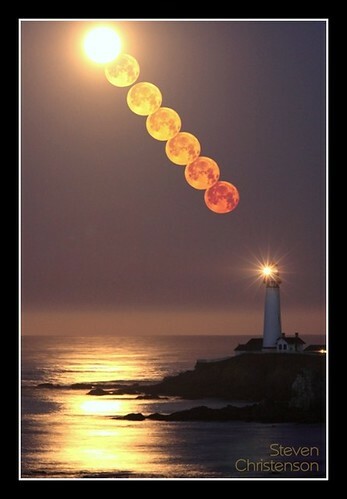 Obviously to create a descending or ascending moon sequence you merely need to combine exposures taken at the appropriate interval. What is that interval? 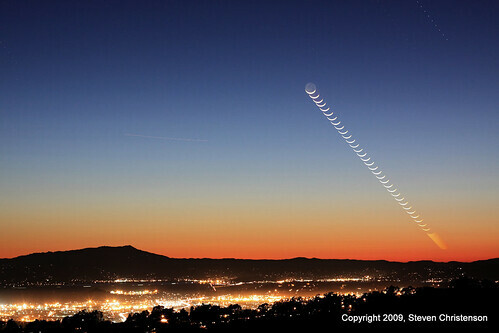 The moon travels roughly its diameter in two minutes. About 2 minutes, 14 seconds to be more precise. I recommend taking exposures twice or four times as often as that, however and just use every-other or every fourth shot. Since I took a simple approach to blend the images I also elected to go simple in presentation. Rather than fight the many different colors inherent in urban night scenes, I used Picasa3 to convert to monochrome, crop and frame the combined image – here using an earlier shot than the “Golf Ball on a Tee” shot above. This also illustrates why taking more frequent exposures gives more creative latitude. This entry was posted in Class, Contest, High Dynamic Range (HDR), Photo Processing, Stacking and tagged alignment, blending, exposures, HDR, moon, stacking, StarStax on March 10, 2012 by Steven Christenson. This is a multi-part question. Answer both parts in a sentence or two to get in the game. Good luck. 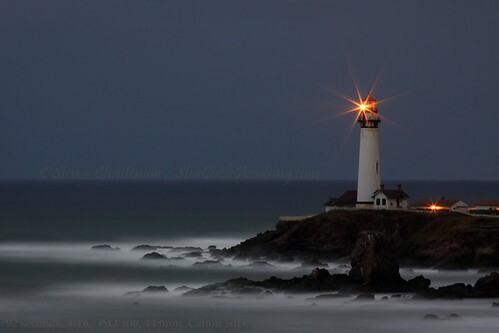 In Photo 1 below, what caused the starburst effect seen near the top of the lighthouse and the porch light in the lower right? NOTE: The starbursts were not added or modified by photo editing. Without resorting to photo editing is it possible to get a different number of spikes? If so, how? Photo 1: What caused these starbursts at Pigeon Point Lighthouse, Pescadero, California? The prize will go to the first entrant who has correctly answered the trivia challenge and also attends the November, 2011 Star Circle Academy workshop. It is not necessary to sign up for or attend a workshop to enter the contest. The order in which the correct and valid entries are received (as determined from the timestamps on the comments) shall determine eligibility for the prize. The staff of Star Circle Academy shall at its sole discretion determine which of the entrants have correctly answered the trivia challenge. If no entries are received or no correct answers are submitted no prize will be awarded. To become a contestant, you must provide your answer in the form of a comment here 0r by using the “leave a comment” link at the bottom of this article. Only one entry per contestant is allowed. You must include your complete, correct name with your entry and a valid email address. Your email address will not be shown or used in any way except to contact you regarding this contest. The staff and immediate family of Star Circle Academy are not eligible to win though they may enter the contest. Entries will be kept secret until the contest ends on April 15, 2011 at 11:00 PM Pacific Daylight Time. Thereafter the first 10 entries judged to be correct will be revealed, along with the answers to the trivia challenge. This entry was posted in Contest, Image, Lens, Trivia and tagged contest, lighthouse, starburst, trivia on March 26, 2011 by Steven Christenson.